Southeast Switzerland is a land of high alpine mountains and a cultural diversity represented by its three languages - German, Italian and Romansh. Bellinzona guards the entrance to the region and is worth visiting for its three spectacular castles as well as for the city itself. The nearby town of Biasca leads to the Valle Blenio, one of the many wild and rocky valleys of the Ticino where there is still a flavour of a by-gone age, although many of the former peasant dwellings are now second holiday homes. Switzerland's most easterly canton, the Graubunden, contains the famously fashionable winter sports resorts of Saint-Moritz, Davos and Klosters, as well as a number of other lesser, but still excellent, resorts such as Arosa and Pontresina. Chur is the main town and gateway to the region and in nearby Maienfeld Heidi was supposed to have enjoyed the Alpine delights. Chur is worth visiting for its massive cathedral and narrow streets. 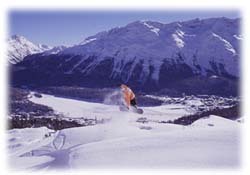 The ski resorts of the region are situated at the top of deep valleys isolated from each other by towering peaks. Go to Arosa for down-to-earth friendliness, Saint-Moritz for expensive chic, while Klosters and busy Davos are somewhere between. They all offer superb skiing. In the summer this region is wonderful for high meadow walking and climbing. Beyond Saint-Moritz is the beautiful Engadine Valley, with the resorts of Celerina and Pontresina. Here also is the Parc Naziunal Svizzer, a spectacularly beautiful area of woods and mountains. Every type of outdoor activity associated with the mountains can be enjoyed here all year round. The Ticino is the Italian speaking southern part of Switzerland, cut off from the rest of the country by the alps and reached across the Saint Gotthard or San Bernardino passes. Although you could almost be in Italy, the region retains the order and tidiness of the rest of Switzerland. A lovely holiday region, especially in spring and autumn, when the temperature is just right for walking, biking and climbing, or in summer when you could be on Mediterranean shores, relaxing among the palm fringed beaches of Lakes Maggiore and Lugano and enjoying the Italian food.